Our concierge will help you decide which of the island’s top destinations are worth visiting depending on the days you have at your disposal and your special interests. A picturesque village boasting some fine old houses, the remains of a Venetian castle on the hilltop and several Byzantine churches is definitely worth a visit in order to experience the island’s famous architecture. 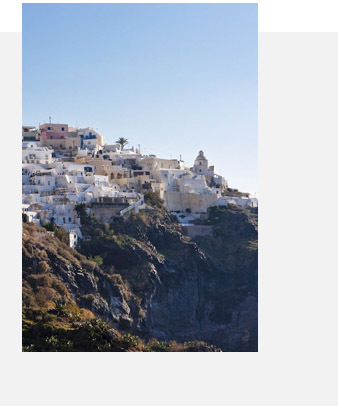 The village of Oia is internationally renowned for the sunsets best viewed from its castle. However, you should avoid the overcrowded castle during high season and instead opt for a stroll through its picturesque alleys, lined with beautiful boutiques, cafes and restaurants. A simple meal with fresh local ingredients next to fishing boats will mesmerise you with its couleur local and charming ambiance.